Look what we’ve cooked up for you: a Notepad Chrome extension. You can now use one of the most popular features in ClickUp all across the web. Note taking on a research project? Use the Notepad Chrome extension. Shopping for Christmas presents? Use the Notepad Chrome extension. Comparing prices on the latest gadgets? Take notes with the Notepad Chrome extension. There are so many uses for this, I won’t list them all, but you get the idea. Once you install the Chrome extension, the Notepad will be visible in the corner of your screen and on every website you visit. Disable it on any site you want with just one click. Interested? Install it from the Chrome store. Why you’re there, get our ClickUp Task Chrome extension as well. This lets you take screenshots, record time and create new tasks right from your browser as well. For current ClickUp account users–your Notepad data from your current ClickUp account will be available as a Chrome extension. It’s all of your notes, all across the web. Install the Chrome extension and use your same account name. 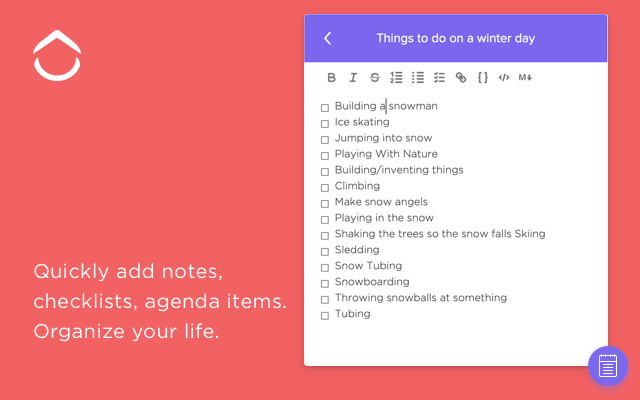 ClickUp is on a mission to make your life productive–isn’t this amazing! Need more? Here’s a help doc that will show you how to start.